The Power Pak is a high-powered backpack CPS-tech blaster. Three CPS chambers and four nozzles make for an HWO's dream. The nozzles are, according to the package, 3x, 10x, Saturator, and Sweep Stream. The shot time with the 3x nozzle is just amazing, and it's nice to have 10x on demand when you need it, though of course with this setting you'll drain the backpack much faster. However, since the reservoir is adequate but not huge, you haven't got an incredible amount of water, and as it's already pressurized it can be easy to use the water rather too quickly. So don't think that you can forget all about conserving water, especially as you have to return to a QFD to refill, don't forget. On a technical note: my Power Pak's O-ring for QFD filling is detachable and easily lost. It might just be my one, but be careful. I'm also having difficulty in filling it from the provided QFD, but that could just be my inexperience with QFD blasters. In addition, make sure that the hose from the chambers to the nozzles isn't bent when you use it, as that can impede the water flow. I'd recommend that an HWO uses this as a heavy back-up blaster with a CPS 2500 or another blaster with a 20x nozzle as his main weapon. Apparently the Power Pak is very rare in the USA now, so pick one up if you can. 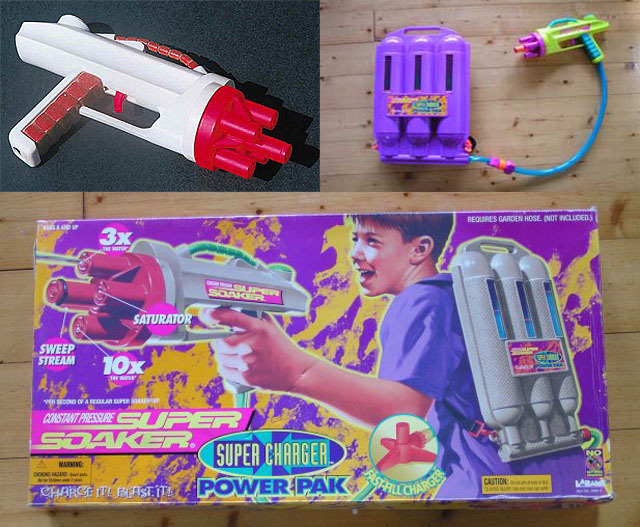 The Super Charger Power Pak is one of my favorite Super Soakers. It is very fragile though and should be treated with care, especially since it's now very rare. The Power Pak is definitely one of the most excellent weapons around and it's a shame it's not available. 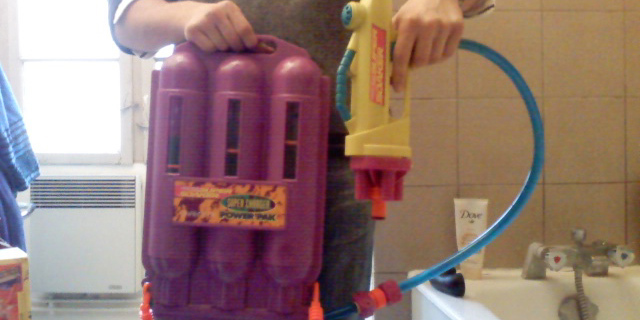 Even with a small reservoir, its fire power is awesome. The Power Pak has four nozzles, only three being somewhat useful: the 3x for water conservation or if you're on a long mission; the 10x for soaking very quickly (Pulse it so you do not waste to much water), the Saturator(Shower Head), my favorite close range nozzle; and the Fan Sweep for blinding someone. The Power Pak's construction appears to be fairly sturdy, even though it'll usually break from non-combat related things such as general wear and tear. I use mine to water my plants. In general, the Power Pak makes an excellent primary that can face all Max-Ds; it can even hold its ground against even the CPS-1700.